Misbehaving Moms | What is ML Reading? It’s time for mom’s to have some misbehaving time. Between all the inclement weather school closings and rearranging schedules, we deserve to have some fun. I love the recent article on Slate, Goodnight Snow Days a satire based on the classic book, Goodnight Moon by Margaret Wise Brown. 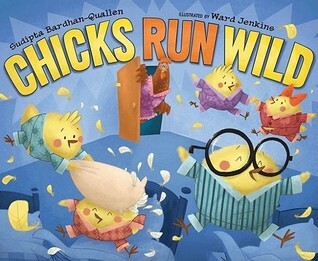 Chicks Run Wild by Sudipta Bardhan-Quallen and illustrated by Ward Jenkins – Every time Mama tucks in her chicks, they wait for her to leave. Then, they go crazy… wiggling, jumping, cartwheeling, somersaulting and pillow fighting. Finally, Mama gets smart and joins the fray. She leads them in a chicken dance; exhausting them to the point where they beg to go to sleep. After Mama tucks them in, her wild evening plans begin. 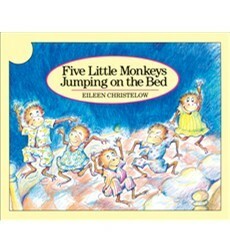 Five Little Monkeys Jumping on the Bed by Eileen Christelow – A funny rendition of the popular repetitive counting rhyme where five monkeys jump on the bed. Gradually all of them bump their head. Each time mama calls the doctor; the response is “No more monkeys jumping on the bed!” Guess who starts jumping on her bed when all the little monkeys are asleep? So on the first nice evening after my new patio is complete, I invite all mom’s to put their children to bed. Then, join me on the patio for some misbehaving. I’ll provide the wine and cheese. Please no jumping on our beds. This entry was posted in Picture Book and tagged Chicks Run Wild, Eileen Christelow, Five Little Monkeys Jumping on the Bed, Sudipta Bardhan-Quallen, Ward Jenkins by mlreads. Bookmark the permalink.